← Voting machine fraud etc. But the most significant problem with the Constitution for the United States is that it was unlawfully suspended with the Reconstruction Act and the 14th Amendment right after the Civil War. This development has not been made known to the general population and even most of those now serving in our armed forces are unaware of it. With the Reconstruction Act and the 14th Amendment the de facto government was officially launched. USA INC was created, our government was placed under the jurisdiction of the military (not Congress), and the ‘President’ was made our CEO with authority to write Executive Orders. The original Constitution did not give the President the authority to write Executive Orders. As Bruce Ray Riggs, candidate for Senate in Florida, correctly pointed out in his video – President Obama signed another Executive Order in January 2010 calling for the establishment of a governor’s council. These governors are to be in charge of the 10 Federal Regions that were established by President Nixon’s Executive order (11647) in 1972 as a response to pressure from the United Nations. 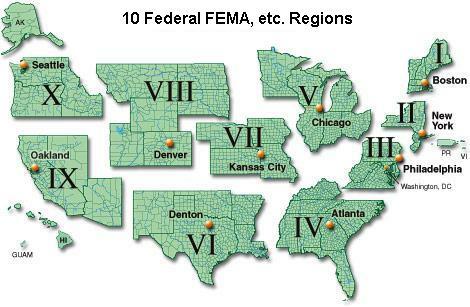 Each major federal agency, such as the EPA, OSHA, DOT, FEMA, etc has already been divided into these regions. Establishing ‘regional authorities’ in our country is very much a part of the One World Earth Corporation model. The suspension of the Constitution has had horrific impacts on the people of our country, including the addition of the Emergency Powers Act  (which is not Constitutional) granting the President the authority to declare an emergency at will thus further suspending any authority Congress (or local governments) might have. This of course explains why the President was able to send our National Guard to Iraq. Meanwhile a regional system for ‘responding to emergencies’ [and law enforcement] has been set up in Ohio (and other states?) at the behest of federal grants for ‘Homeland Security’. Franklin County Homeland Security and Justice Programs And Ohio has also been divided into Homeland Security Regions – challenging the authority of our elected county Sheriffs. Rod Class (and company) are working very hard to correct the fraud and corruption that has resulted from the Reconstruction Act and the fraudulent passage of the 14th Amendment (a de facto government). He is currently processing a complaint to be presented to the Coast Guard on behalf of everyone in our country. This entry was posted in corruption, Government and tagged 14th Amendment, Con-Con, constitution, reconstruction act, Regionalization. Bookmark the permalink.